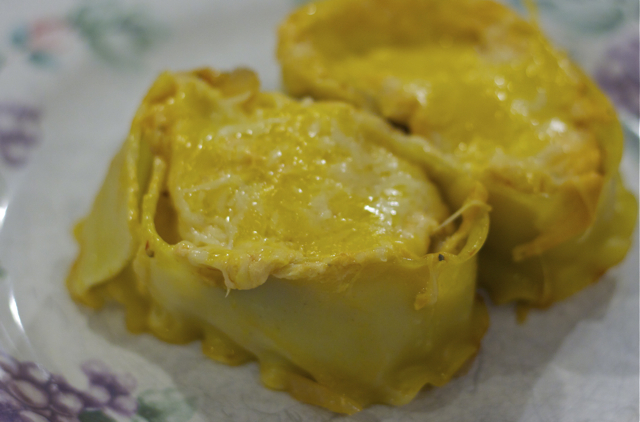 My Chicken Lasagna Wheel recipe has a special place in my heart. Nearly 20 years ago, it was one of my first attempts at making a “gourmet meal” and my first attempt at making a recipe my own. And it was a huge success. I loved it, my new husband loved it, and even my mom loved it. I think that sealed the deal on my joy in cooking. Each major part of the lasagna can stand on its own. My oldest son and I taste and sample the chicken mixture and the cheese sauce to the point that I worry I’ll not get to making the lasagna. Over the years I’ve tweaked and adjusted ingredients a little. I now prefer the texture and ease of rotisserie chicken rather than cutting up and cooking raw chicken breasts. I also just swapped sliced mushrooms in favor of artichokes. I love both versions, but it’s amazing how many people I serve don’t like mushrooms. What’s up with that? The artichokes are a wonderful, crowd-pleasing change. 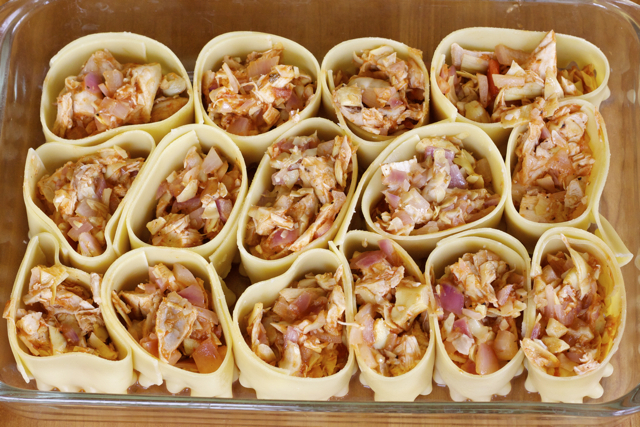 Chicken Lasagna Wheels before the cheese sauce. Cook lasagna noodles according to package directions. Strain and run cool water over noodles to stop cooking. Halve noodles with a sharp knife the long way (two long strips with each having one curly edge). Wrap each strip around your fingers to form a 3-inch ring and arrange rings in a 9×13 pan. In a large, deep skillet warm olive oil on medium heat. Add onion, artichokes and garlic to the pan and saute for 3-5 minutes. Reduce heat and add chicken pieces, wine, 1/2 of the spaghetti sauce, salt and pepper to the skillet. Simmer for 3 minutes. 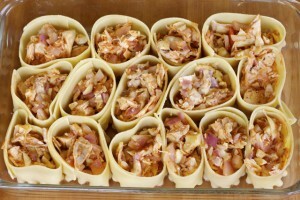 Using a slotted spoon, fill lasagna “wheels” with meat mixture. Return skillet with remaining liquid to low heat and add the rest of the spaghetti sauce, cream cheese, sour cream, 3/4 cup cheddar cheese and 1/2 cup mozzarella. Stir until smooth and pour evenly over lasagna wheels. Top with remaining cheddar and mozzarella cheese. Bake, covered, for 35 minutes. Serve warm. *You can use 4 raw, boneless chicken breasts as well. Cut them up into bite-size pieces. Add the pieces to the wine and spaghetti sauce and cover and simmer the mixture for 8 minutes to cook the chicken through. Another note: I’ve made bigger batches of this lasagna with great success. You can use the entire rotisserie chicken…dark and light meat.